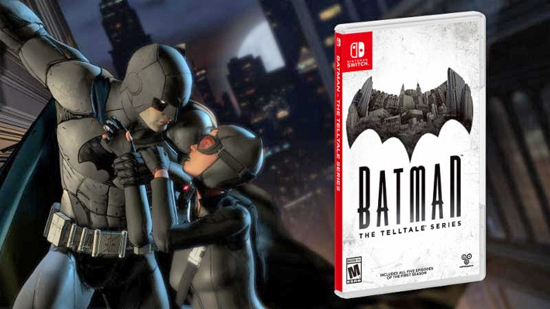 The first season of Telltale's fresh take on Batman canon comes to Switch on November 14 in North America and November 17 in Europe and Australia. Award-winning publisher and developer Telltale Games, in partnership with DC Entertainment and Warner Bros. Interactive Entertainment, today confirmed that Batman - The Telltale Series will launch on Nintendo Switch on November 14 in North America and November 17 in Europe and Australia. The full first season will be available both digitally and at retail; both formats will cost $39.99 USD in North America. All five episodes will come already loaded on the retail cartridge. Batman - The Telltale Series gives players the opportunity to role-play as both Bruce Wayne and Batman in a fresh take on Batman canon. In the series' opening episode, 'Realm of Shadows,' Bruce Wayne is forced to question everything he thought he knew about his identity when he discovers his father was in fact a ruthless crime boss. As both Bruce and Batman, players must negotiate harsh political turmoil and prevent Gotham City from descending into chaos while digging into the truth about the Wayne family's sordid past. Batman - The Telltale Series was praised by fans and critics alike, with The Verge proclaiming it's "among Telltale's best work to date" while emphasizing "it's not just Batman, it's your Batman." Game Informer called it "one of the best experiences by Telltale in recent memory, period" while Heavy.com wrote that Telltale "truly knocked it out of the park." Digital Spy deemed it "the freshest Dark Knight take we've seen in years," which io9 echoed, calling Telltale's Batman "video games' best Bruce Wayne ever." Batman - The Telltale Series is a standalone product separate from the second season, Batman: The Enemy Within. It is currently available at retailers across North America on a special 'Season Pass Disc' for Xbox One, Xbox 360, PlayStation 4, and PlayStation 3. The disc includes the first episode of the season, as well as access to download all subsequent episodes through an online connection.